The German Masters Sale 2018 goes in the books as a very successful edition and broke the European record on a European live sale ever, the package of the #1 & #2 RZG bulls sold for EUR 212.000 to Sexing Technologies, USA. The sale was held this year for the first time in the brand-new facilities of the RUW in Fließem, the Auktionshalle in Fließem. Almost 1000 people attended the sale which created a great atmosphere throughout the complete sale. There were as well many viewers online who were also active bidders. The online bidders together with the bidders attending the sale created a never seen interaction. A great clearance throughout the sale resulted in 131 out of the 134 live lots were sold for an average price of € 6.627, the 14 embryo combinations averaged almost € 688 / embryo! Lots sold to no less than 14 different countries! Topselling female this year was Lot 21. Mattenhof Unix Gaiana – she is the #1 PTAT & DGV-Conformation daughter of Unix in the World and comes from none other than the Swiss Expo, & European Grand Champion Galys-Vray EX-94-CH. Gaiana sold for € 30.000 to an international partnership. 2nd highest female of the day was a consignment of Islandpride- & Riverdane Holsteins from the UK, Lot 10. sold for EUR 25.000 – she is a GTPI +2854 / NM $ 970 Rubi Agronaut daughter from the Windsor-Manor Rud Zip EX-95-USA cow family. 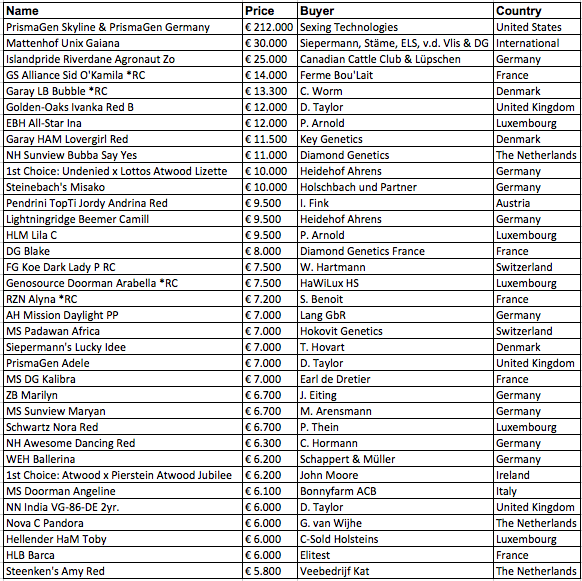 The GERMAN MASTERS SALE is organized by Nosbisch Holsteins, Eurogenes & RUW.